Love and freedom are inextricably connected. The two are interdependent. Without love, you cannot experience true freedom. 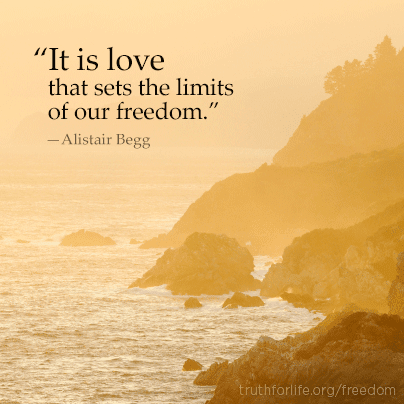 Without freedom, love isn’t love. “The truth will set you free.” But what is the truth? “For God so loved the world that he gave his one and only Son, that whoever believes in him shall not perish but have eternal life” (John 3:16). The truth is revealed by the loving character and actions of our Lord. That’s how He gives us freedom. 1 John 4:19 says it concisely: “we love because he first loved us.” The love we have to give, in and of ourselves, is limited by our sinful nature. Our natural love is flawed and distorted. But the love of God, instilled in us and flowing through us by the Spirit –that’s perfect. In Christ, we are free to truly love others as He intends, in His timing, as His children. Sin, as exemplified by Satan’s temptation tactics, tells us that who we are isn’t enough and that we can change who we are in order to be like God. We’re enslaved by the sinful conviction that we must take the place of God in our lives. When we ground our hearts in the love of Christ, we find that we can be who we are and that His grace is sufficient (2 Corinthians 12:9). In the person of Christ, God “Himself bore our sins” (1 Peter 2:24). The Lord who created everything and lives forever died for you and me before rising again. He “gave Himself up,” temporarily surrendering His freedom and rightful place. And He did that because of His great love for us. When Christ died and rose again, we were redeemed. Each of us was “bought with a price; do not become slaves of human beings” (1 Corinthians 7:23). Instead, your freedom means being a “slave to righteousness” (Romans 6:18). When you love the Lord, you surrender your will and your freedom to Him that you may gratefully serve Him as an expression and a natural result of your love. The Lord’s love sacrifice’s self. Those who love the Lord plead “take this cup if you are willing” and obey when the answer is “no” (Luke 22:42). Often encumbrances on our freedom are the result of loving others as the Lord does. Consider the fruit of the Spirit. Those fruits aren’t conditional on those you love behaving how you would like them to. To love like the Lord, you set aside your freedom to sinfully manipulate others or to seek personal gain, and you emulate Godly love (patiently, gently, meekly) as others use their freedom (even in ways you don’t like)!